A 5th century Chinese treatise on brush & ink drawing offers this cryptic advice: “By the movement of the brush, establish the bones.” What are “the bones” in a drawing? Without bones the body would be a limp sack of skin like the one Michelangelo depicted in his painting of the Last Judgment. Without wood or steel framing, a house would be a shapeless pile of bricks. Bones give structure and form to the visible world. In tonal drawing, the “bones” is the broad tonal patterning that links the various parts into a cohesive whole. The draughtsman seizes on this as a means to create a unified composition. The Chinese notion of bones relates to the concepts of Notan in Japanese art, and also to the idea of Macchia in 19th-century Italian painting, all of which are based on rendering light and dark in terms of simplified tonal patterns. Because the human eye is so sensitive to tonal nuance, learning to simplify values takes practice. Looking at master drawings is a shortcut to developing this ability. Attributed to Caravaggio, the drawing above adopts a curious strategy. Instead of allowing unlimited tonal gradations, as do the drawings in an earlier post, Caravaggio translates the visible spectrum into three distinct flat tones, or “steps,”and uses this simplified palette as a means to discover the hierarchy of his subject through the placing and massing of the lightest lights, the darkest darks, and everything in-between. The interweaving tone patterns move independently of the lightly sketched outlines of the figures or objects. Certain edges disappear. Parts of forms tilt into and out of the light. Despite the elimination of gradation and detail, the drawing remains surprisingly luminous and evocative, encouraging the viewer to finish it. 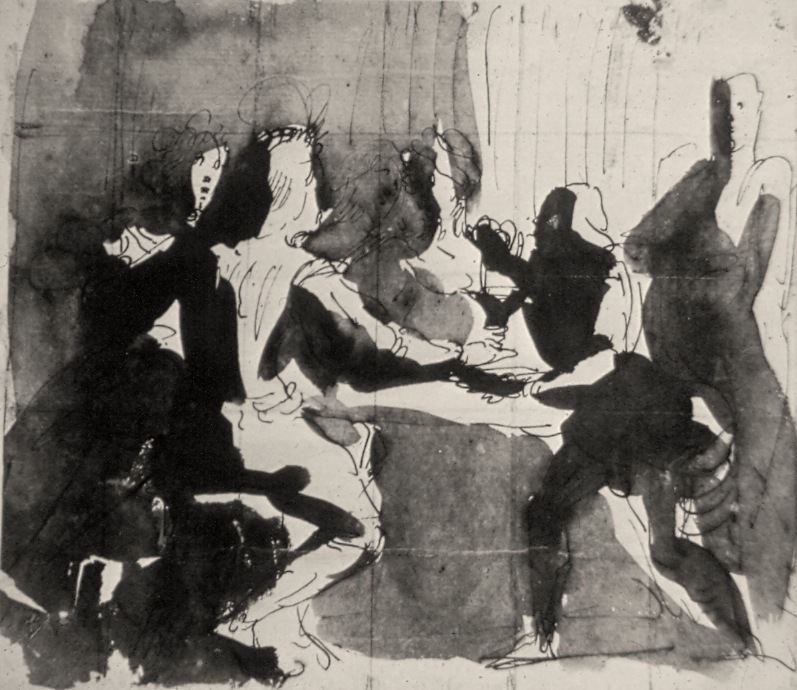 For artists whose livelihood depended on the integrity of their compositions, value studies such as these were a means for discovering, simplifying, organizing, and expressing the essential massing of light and dark in their subjects. To appreciate such brevity and abstraction it’s important to understand that this drawing, and the others that follow, are really about structural contrasts and relationships, not things. Using a limited number of tones is a way to sift out the clutter of small details and fractional half-tones to get to the poetry of the big abstract tonal structure – the real bones of the subject. Composition: A Series of Exercises in Art Structure for Students, by Arthur Wesley Dow, 1920.